A friend of mine told me that the Israeli Beer GOLDSTAR is sold at a place in Ft. Lauderdale and I couldn’t believe it! I called The Riverside Market on my way home from work and the manager didn’t think he had it, but my friend was adamant about seeing it with his own eyes. I decided to get there and see for myself. The market has 400 craft beers in coolers on the left when you walk in and I found it right away. I picked up a few and took it to the counter. Since my initial trip to Israel, I have tried to find GOLDSTAR in the U.S, but I had given up. I was so excited and I knew that others would share in my excitement too! I wanted to tell everyone I knew that this place had it, and then it hit me! 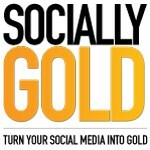 Throw a SociallyGold(Star) Launch Party to promote my social media blog, it’s a great play on words! As an incentive, the first 25 people to show up will get a free GOLDSTAR provided by SociallyGold!